After seeing how the acrylic ink pours that I did a couple days ago dried and looked when dry, I decided to try some more. This time I was a little more careful of how much Floetrol I added. I used about 30-35% Floetrol, since the FW Inks are so heavily pigmented. I added about 10 drops of silicone. (Since I had so much silicone spray, I collected the spray in a bottle with a dropper, outdoors, for more accurate application, and less air pollution indoors when using it. ) Even with that much diluent the colors are dark and bright appearing. 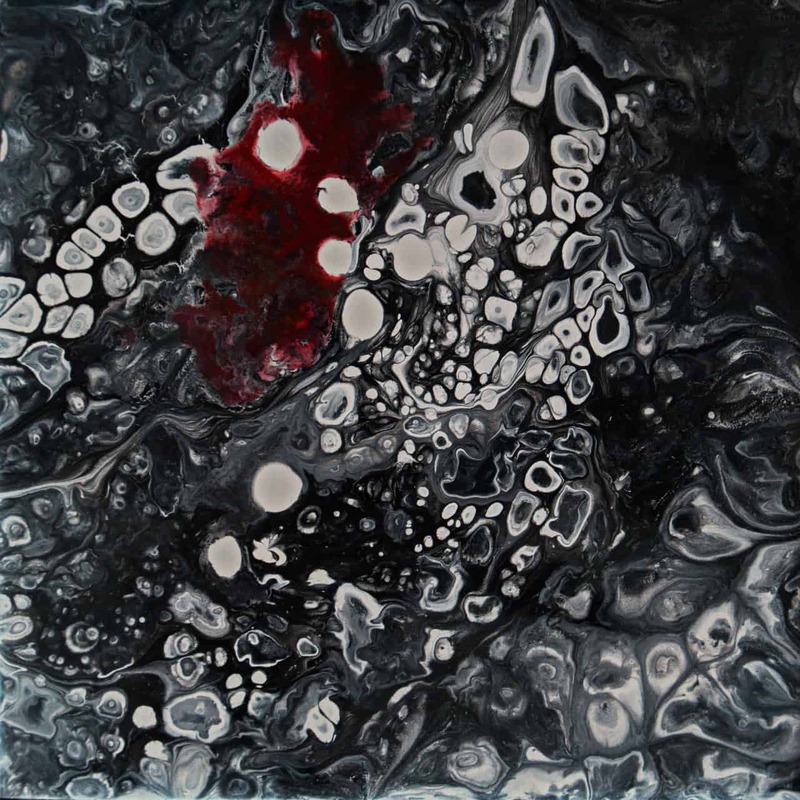 The first pour was a swipe pour on a piece of gessoed mat board, about 11×14″ (27×35 cm) I had stapled to a paint board. 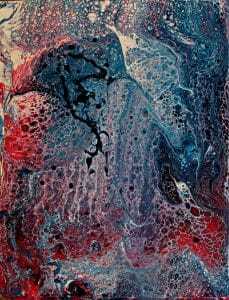 I think pouring on a paper base, instead of a non-absorbent surface like a tile, hastens the drying process immensely. The same applies to using canvases, but when it’s dry there’s no canvas pattern showing. 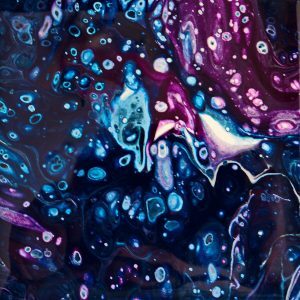 First Pour – A swipe pour using Acrylic Inks, Floetrol and silicone. 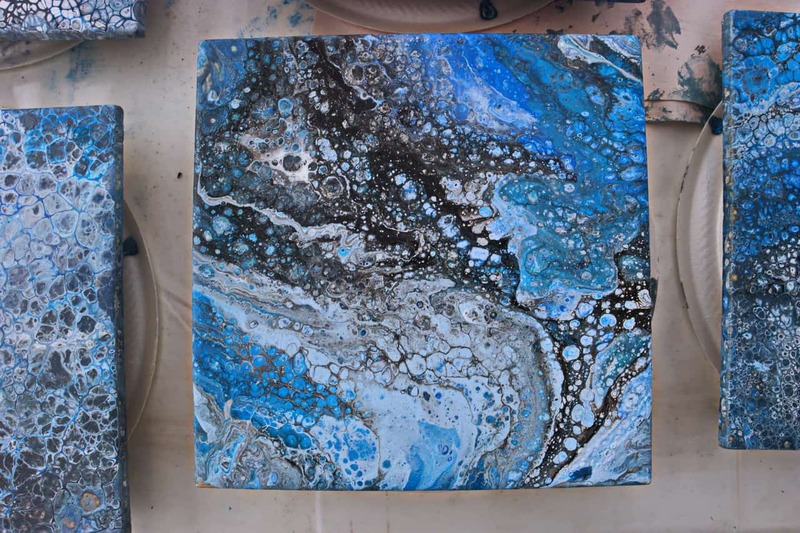 I still had quite a bit of paint left, so did a dirty pour on an 8″ tile. The excess paint that ran off from that pour is very interesting, and I’ll leave it on the Freezer Paper to dry and peel off in a couple days. 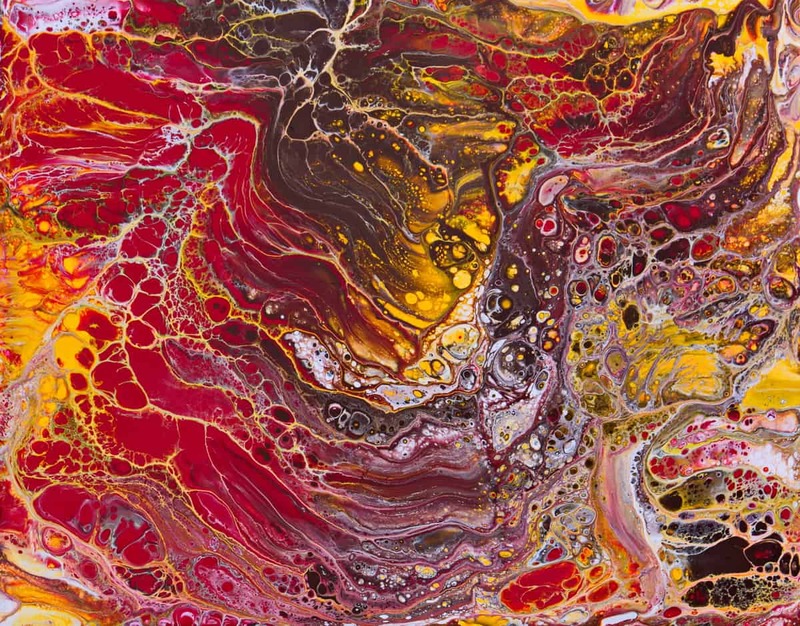 Second pour –same paints as first one. Runoff from 2nd tile pour. 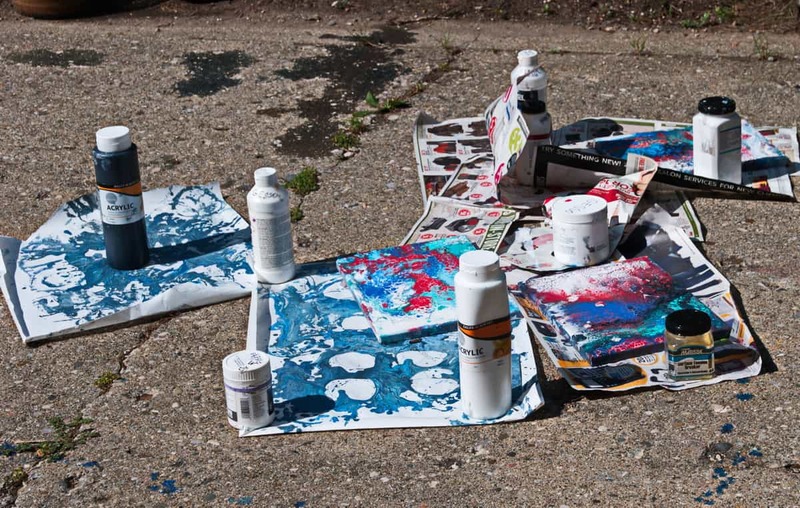 Still had some paint left–gee, does it reproduce and multiply in the cup? So did a 4″ tile. Didn’t have but a few drops of the red left, so it doesn’t show. 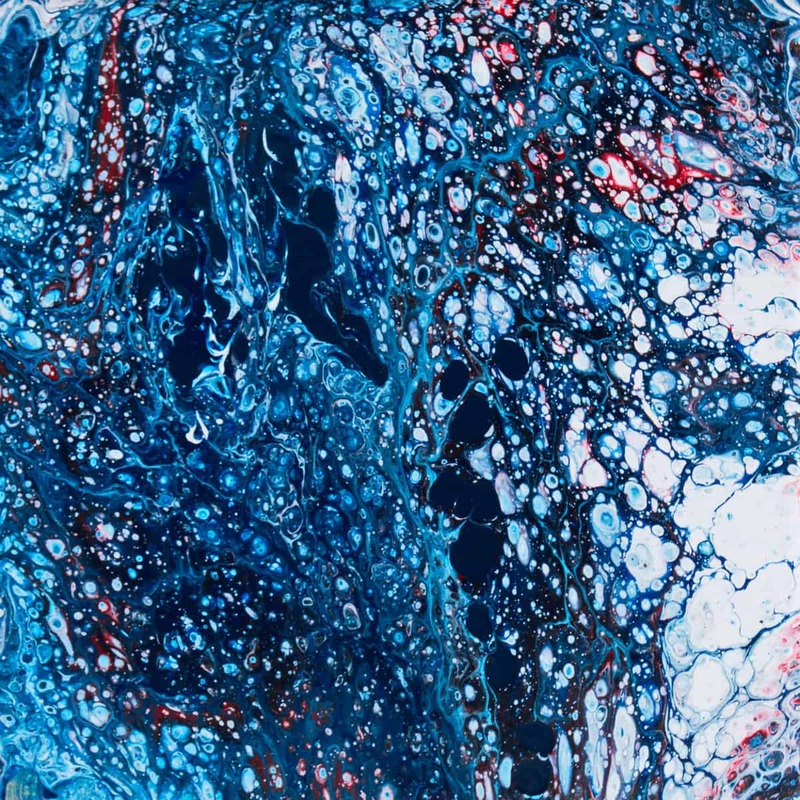 Leftover paint from two previous pours–this is a 4×4″ tile. Acrylic ink and Floetrol and silicone. Will be interesting what these look like in a couple days when they’re dry. I’ll post some more pictures then. Day three was spent on collage, mainly using the collage papers that we did on the 2nd day. Everybody seemed very successful. Then today, it was very quiet and I still had my stuff ready to work on, so I almost finished it. Still have a few more pieces to add. We had three different kinds of mixtures being used today, all giving about equally good results. One was using PVA glue mixed with water and liquid Silicone. Another was using PaintEasy and silicone spray, I was using acrylic inks and Floetrol. 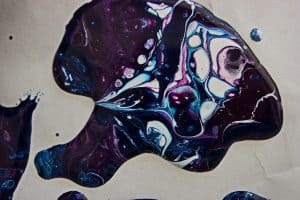 The determining factors in the types and sizes of cells seemed to be three things–one the thickness or viscosity of the acrylic mixture, and two, the amount of paint used, and thirdly, to a lesser degree, the amount of silicone used. Some images of different pours. Beautiful pour, using Pain Easy. 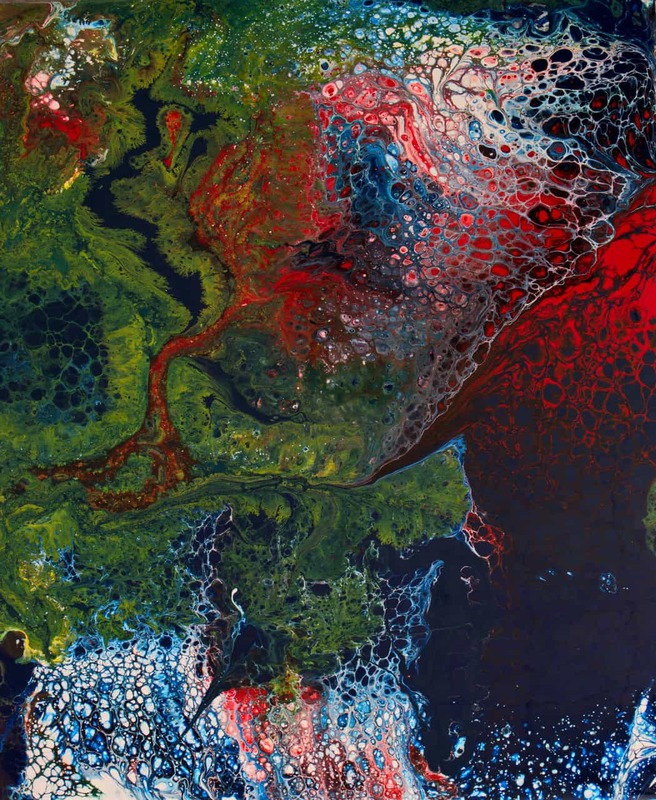 She initially had problems swiping it, but after a couple trys and adding more paint got this beautiful result. 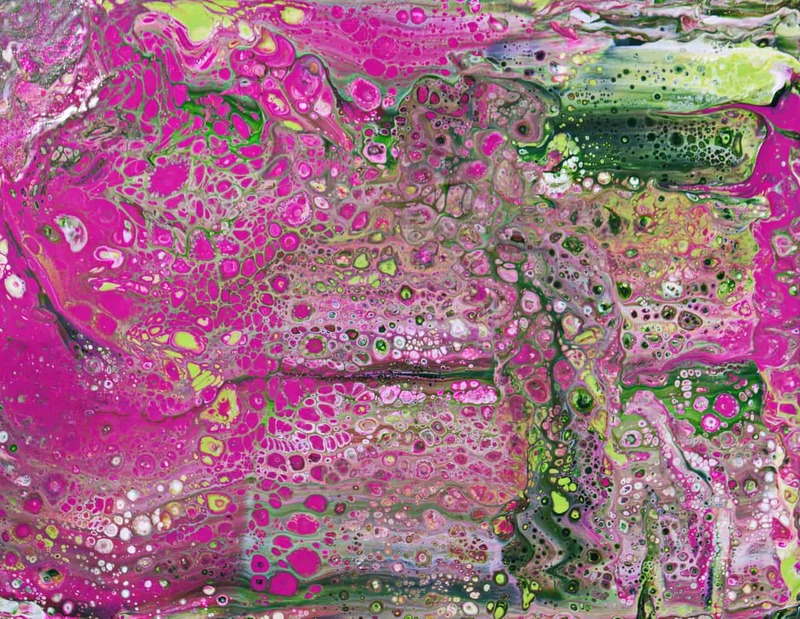 This is a swipe pour using PVA glue (Elmers) diluted with water and thinner tube paints and silicone. 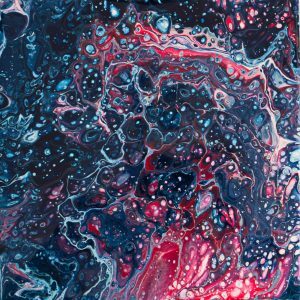 I did this swipe pour as a demo to show how to do swipe pours. . Used FW Acrylic ink and Floetrol and silicone. It was on a rather thin hardboard that I had a couple coats of gesso on from and back. This was using PVA glue and spray silicone, pour done on an 8" tile. A little windy today also. But beautiful cloudless sky that dried things well. 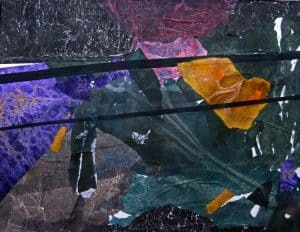 Tomorrow we’re going to be using the collage papers from yesterday to do an abstract image, inspired by a photograph from me. The gals really worked hard today. Here’s a few shots of the work. Lots of supplies and equipment filled up the garage. A good variety of types of paint. Helps making abstract/experimental images easier and better. Good notes help too. 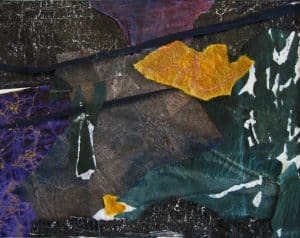 Using acrylics to make new collage papers for use later on. Need lots of room for all the paint and supplies. It was quite windy out for these light papers and plastic, so we had to weigh down all corners to keep them from being blown away. I entered this piece in this year’s ISEA exhibition at BigArts in Sanibel, FL and received notice last week that it was accepted. So, now the process of varnishing, framing, packing and mailing it off starts. It was started on my spinner after coating the whole piece of Yupo with black gouache and then applying fluid acrylics on top. When they were thoroughly dry I hosed off most of the gouache, and then enhanced some of the other areas by hand painting. This piece I started a couple winters ago, by copying shadows cast by a bush outside with an early winter sun. But it just didn’t seem to work. So after experimenting recently with water soluble embroidery stabilizer I applied that over the previous working using a somewhat dilute gesso. This created a great texture as well as subduing many of the lines. Some, I repainted to emphasize them. Just varnished it today, and I have a black frame I’ll mount it in for hanging.